An alien landscape, an abandoned space station the twisting corridors of your own starship - the possibilities for adventure are endless with Starfinder Flip-Mat: Basic Terrain! Designed for the Starfinder Roleplaying Game but appropriate for any RPG, this invaluable gaming accessory presents two subtle textures - dusty ground on one side and metal floor plating on the other - providing Game Masters a blank canvas on which to draw any terrestrial battlefield, space-age facility, or adventure set piece they desire. Whether your party is facing down a convoy of ratfolk scavengers or breaking into a robot prison on a machine planet, you'll always have the right map at hand. Don't feel like you always have to run your game in someone else's world. 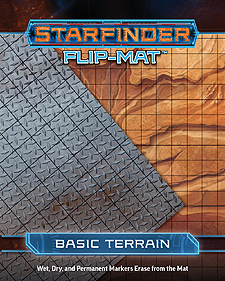 With Starfinder Flip-Mat: Basic Terrain, the setting of your next adventure is wherever you can imagine!